Mother-of-pearl a nacreous, lustrous, iridescent lining of the shell of a mollusk that can be carved and cut for jewelry and other decorative purposes. It is composed of calcium carbonate bound by conchiolin which together forms nacre. Mother-of-pearl is carved into various motifs to be used in jewelry. Slabs of mother-of-pearl decorate cuff links, shirt studs, buttons, watch faces and are used as inlay in various decorative objects. 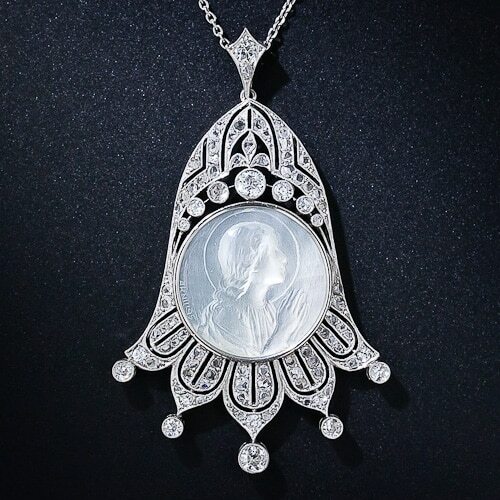 Edwardian Mother-of-Pearl, Diamond and Platinum Pendant. 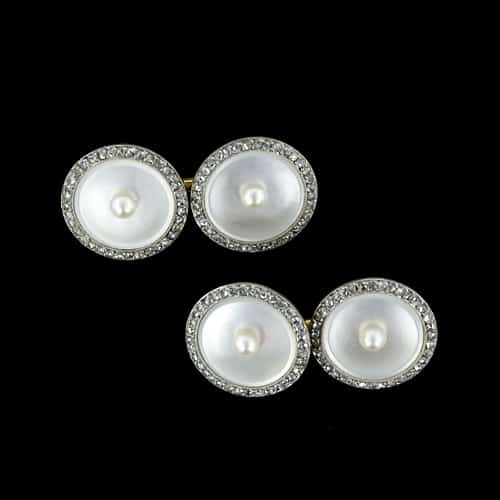 Art Deco Mother-of-Pearl and Pearl Cuff Links.